Retire to Prescott, and enjoy the four seasons... Even though Prescott is only an hour and a half Phoenix, Phoenix elevation 1100 feet. The fact that Prescott sits at 5200 feet, means snow in the winter and 15 to 20 degrees cooler in the summertime..
Prescott was the initial capital of the Arizona territory in 1863... Phoenix became the capital in 1889... The initial attraction to Prescott...gold. Prescott it is still a small town, with a population of 42,000. Prescott is sometimes called, Arizona's Victorian city...here are 700 structures on the national register of historic places...the downtown area, centered around the courthouse square, is a great place for a stroll, shopping, or a fine meal. Prescott has been recognized by several entities for art and culture...it was ranked among the top 50 cities to live in, by National Geographic adventure. Here is a link to the county website. When we say retire in Prescott, it also includes Prescott Valley Prescott Valley 15 miles east of Prescott, has 23,000 residents. 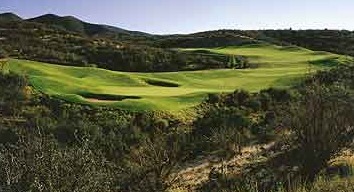 This photo shows the Stoneridge golf course, an excellent course open to the pubic...it is a great test of golf. DO NOT try and walk this course...it is up and down like crazy...also very scenic. This course is one of my favorites in AZ... I have played quite a few of the over 400 courses you have to choose from in AZ. It even meets my frugal bride's first necessity for living in a city...it has a Costco...I mean really you must have a Costco handy. Why choose Prescott for best Arizona retirement living? It is close enough to Phoenix, a pleasant drive of an hour and a half, and the big city amenities. It is also small enough to have a real small town feel...and if you don't mind a little snow in the winter, you should give Prescott and Prescott Valley, a good look when deciding where to retire in Arizona. Combine a mild climate with all of the historic buildings in Prescott, and it's no wonder that Prescott is finding favor among Arizona retirees. I have many friends that live there during the hot Phoenix summers...as the crow flies its about 60 miles from our house...takes about an hour and a half to drive...big difference in temperature.